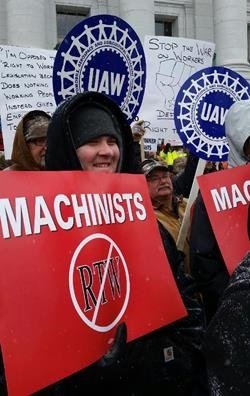 Working people in Wisconsin were having a bad week already. Their own state representatives, paid for and bought out by corporate interests, are ramming through a so-called “right-to-work” law for no other reason than to silence workers’ voices and eviscerate unions. Anti-worker Gov. Scott Walker said he expects to sign the legislation into law this week. But then Walker, trotting around the country boasting his bona fides as he gears up for a 2016 presidential campaign, stopped by the Conservative Political Action Conference (CPAC), the annual circus-like gathering for far-right activists and fawning young conservative operatives-to-be that takes place in suburban Washington, DC. IAM District 10 members took the Wisconsin state capitol in Madison on Saturday, February 28 to protest the state’s GOP-majority legislature’s plans to pass a “right-to-work” law. Walker gave a 15-minute stump speech to the crowd before being asked a question from a board member of the American Conservative Union, the political organization that hosts CPAC. ISIS is the terrorist group in Iraq and Syria that is beheading innocent people, massacring prisoners and exterminating entire communities. Walker responded not with a plan, but with how his battles against organized labor in the Badger State have prepared him to take on…you guessed it, ISIS. 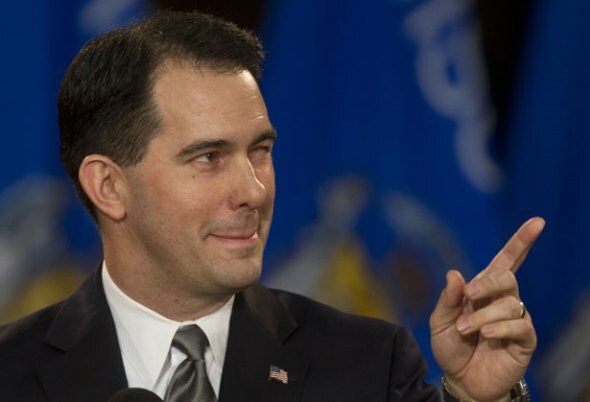 Walker was the target of massive, but peaceful, protests in 2011 when he signed into law Act 10, which stripped collective bargaining rights from almost all of the state’s public employees. IAM members and other union members have been picketing the state capitol in Madison again as the state legislature is poised to pass right-to-work legislation. Walker made similar comments just a week earlier at an event for a group of wealthy donors advocating conservative economic policies. Add your name to a growing petition to stop right to work. If you live in Wisconsin, send an email to your state representatives.